This category is split into 13 pages. This is page 11. 22 China, Chinese Government 8% Skoda Loan II, dated 1925, bonds for £1,000, £500, £50 and £10, ornate border, various colours, all with coupons, all VF. (4). 27 China, Chinese Imperial Government 1898 Gold Loan, bond for £500, British issue, ornate, large format, mauve, with coupons, some edge damage and minor tears, F. (1). 41 China, Republic Chinoise Gold Bond of 1928, (Belgian Boxer), bond for 100 U.S.A gold dollars, blue on pale green, also Gold Bond of 1925, (Boxer Loan), bond for 50 U.S.A. gold dollars, both with coupons, both VF. (2). 42 China, Shanghai Municipal Council 6% Loan of 1926, bond for 100 taels, vignette of building, black on orange, VF. (1). 43 China, Shanghai Municipal Council 6% Loan of 1934, bond for 100 silver dollars, vignette of building, black on orange, VF. (1). 49 Collection, 49 bonds and certificates, dated 1887-1956, titles include, Colombian National Railway Co. Ltd. 1903, S.A. Bulgare de Carrieres 1924, Cairo Electric Railways and Heliopolis Oases Co. 1907, Comp. General de Minas y Sondeos 1901, Mines de Balia-Karaidin 1925, Daggafontein Mines Ltd. 1936, Armavir-Touapse Railway 1909 Loan, Costa Rica Railway Co. Ltd. 1887, copies of unissued bonds bearing the portrait of King Farouk of Egypt 6 types, Electricity and Ice Supply Co. 1929, mostly European, a little duplication, F-VF. (49). 56 France, 6 cinema related certificates, all issued in Paris, Phonographes & Cinematographes ‘Lux?, 1906, Cinema-Banque S.A., 1909, Société des Films Eclipse, 2 types, 1907 and 1918, Société des Etablissements Gaumont, 1927, and Société de l?Apollo et des Cinemas Nantais, 1922, five with vignettes, all with coupons, F-VF. (6). 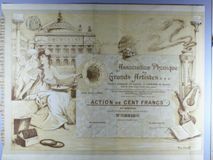 59 France, La Vinicole Forezienne S.A., share certificate, Saint-Etienne 1899, very decorative design includes bottles, barrels, vines, vineyard, buildings, cherubs, dull mauve, with coupons, AVF. (1). 62 Great Britain, 12 bonds and certificates plus 16 stock receipts, dated 1849-2003, titles include, Consolidated 3% Annuities 1879, £3-5/- Annuities 1849, Cape of Good Hope Stock 1904, Oriental Inland Steam Co. Ltd., 1859, New Granada Co., 1852, Sunderland PLC., 1997, Roumanian Development Syndicate Ltd., 1912, mostly F-VF. (28). 63 Great Britain, 12 bonds and certificates, dated 1874-1937, titles include, J. & P. Coats Ltd., 1901, Waring and Gillow 1913, Middleton & Tonge Cotton Mill Co. Ltd., 1875, discoloured, Felted Fabric Depot Ltd., 1874, National Cotton Spinning Co. of Bulgaria Ltd., 1907, Springhead Spinning Co. (1920) Ltd., 1935, F-VF. (12). 66 Great Britain, 15 certificates, dated 1882-1919, titles include, Northern Counties Constitutional Newspaper Co. Ltd. 1882, Toxteth Real Property & Investment Co. Ltd. 1905, Fishguard and Rosslare Railways and Harbours Co. 1911, Ellenborough Colliery Co. Ltd. 1910, Nirpuzha Rubber Estates Ltd. 1906, Clark & Son (Whitehaven) Ltd. 1912, East Coast Oil and Produce Co. Ltd., 1919, mostly F-VF. (15). 68 Great Britain, 20 debentures, dated 1892-1930, titles include, Leadbeater & Gill Ltd., 7 x debentures, all 1906, W.B. New, Langton & Co. Ltd. 1892, George Wood (Leeds) Ltd. 1911, Brayshay?s Ltd. 1899, John Spencer & Sons Ltd. 1908, S. Chaffer & Son Ltd. 1912, Staffordshire Potteries Water Board 2 types 1925-30, National Minerals Corporation Ltd. 1909, mostly VF. (20). 69 Great Britain, 23 certificates, dated 1930-1949, titles include Leach?s Argentine Estates Ltd. 3 x certificates 1935-47, Imperial Tobacco Co. Ltd. 1936, Ebbw Vale Steel Iron & Coal Co. Ltd. 1933, Associated Brick & Tile Works Ltd. 1930, Associated British Picture Corporation Ltd. 2 x certificates both 1946, Camwal Ltd. 1949, mostly VF. (23). 71 Great Britain, 26 certificates dated 1950-1972 titles include F.W. Woolworth & Co. Ltd. 1950, National Provincial Bank Ltd. 1957, British Oil & Cake Mills Ltd. 1955, Unilever Ltd. 1954, Daily Mail and General Trust Ltd. 1954, Associated Newspapers Ltd. 1952, De La Rue Co. Ltd. 1959, Imperial Chemical Industries Ltd. 1958, Royal Exchange Assurance 1960, minor duplication, mostly VF. (26). 72 Great Britain, 3 colliery certificates, Brynlloi Colliery Co. Ltd., certificate for one share 1874 black with coupons, Bettws Llantwit Colliery Ltd. certificate for one share 1873 black with coupons, also Snowdown Colliery Ltd. Kent certificate for preferred ordinary shares 1912 vignette of colliery, red, all VF. (3). 73 Great Britain, 7 certificates, St. Leonards-on-Sea Grand Hotel Co. Ltd., 1883, Land Securities Ltd., 2 x certificates, 1867 & 1871, Navan & Kingscourt Railway Co., 1871, Great Northern Railway Co., 1846, Common Fund Co. Ltd., scrip, 1869, and Metcalfe?s Hydropathic Establishment Hastings Ltd., mostly VF. (7). 75 Great Britain, 9 bonds and certificates, 1854-1929, titles include, Mediterranean Electric Telegraph, 1854, Bank of Hindustan, China & Japan, 2 types, 1863-64, Ocean Consolidated Co. Ltd., 1929, Ramsgate & Margate Tramways Co.,1883, Poor-VF. (9). 78 Great Britain, Anglican Smelting, Reduction & Coal Co. Ltd., book containing 100 unissued certificates for ten shares, all 1858, ornate heading, black on white, mostly EF. (100). 79 Great Britain, Bury Port and Gwendreath Valley Railway Co., share certificate, 1866, ornate heading, black, embossed seal, VF. (1). 82 Great Britain, Cornwall Railway, certificate No. 6634 for one £50 share, and certificate No.7152 for one £25 share, both 1846, black on green and black on white respectively, both VF. (2). 83 Great Britain, Cunard Steam Ship Company Ltd., Mortgage Debenture for £100 dated 1909 and signed by Thomas Royden, blue on white. Very fine. 88 Great Britain, Leeds Banking Corporation share certificate No2 dated 1860, small format on vellum, creased at folds, very fine. 90 Great Britain, Manchester and Salford Water Works, memorial No.196 in respect of a transfer of ten shares, dated 1819, printed on vellum, black, VF. (1). 91 Great Britain, Marine & General Acoustic Co.Ltd.,certificate for 50 £1 shares,1937, green. Creased at folds. Together with a prospectus stating company's intention to acquire Watamps Company (concerned with the development of an advanced system of Wireless Control and Relay capable of meeting the special requirements of the British Admiralty). 93 Great Britain, Montague Obligation Bonds (4) 1613-1620, on vellum, further details of each piece sold with lot, very fine. 94 Great Britain, Moss Hall Coal Co. Ltd., 10 x debentures, all 1899, large format, black, red seal, all VF. (10). 95 Great Britain, Norfolk Estuary Co., 9 x certificates, all 1847, small format, black, all VF. (9). 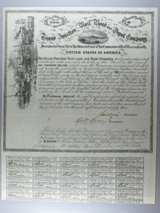 96 Great Britain, Schultze Gunpowder Co. Ltd., certificate for ordinary shares, 1905, vignette of fist holding lightening bolts, printed by Waterlow, black & orange, VF. (1). 97 Great Britain, Shrewsbury and Hereford Railway Co., certificate No.24744 for one share, 1846, vignette of rural scene with castle in background, black, VF. (1). 99 Great Britain, Universal Weldless Steel Tubes Co.share certificate 1897, creased otherwise very fine. 101 Great Britain, Whitby & Robin Hood?s Bay Steam Packet Co., 5 x share certificates, 1853-57, two printed on vellum, small format, black, VF. (5). 106 Ireland, Waterford and Limerick Railway Company Share Certificate for one share of £50 to John Pullien of Dublin dated 19th November 1845.Extremely fine. 107 Ireland, Waterford, Wexford, Wicklow and Dublin Railway Co.certificateno. 35110 for one share of £20 to Sir John Doveton of Sussex Square, Hyde Park, K.C.B., dated 30th Jan. 1847, black, very attractive design with large coat of arms at top, black, with green seal, very fine. 108 Italy, Genoa and District Water Works Co. Ltd., debenture for £20, dated 1913, attractive vignette of Genoa harbour with many ships, text in English and Italian, black & red, with coupons, VF. (1). 109 Italy, Société Anonyme for the Sale of State Domains of the Kingdom of Italy, coupons de jouissance to bearer, series K and series D, both 1865, both ornate with Italian arms at top, also S.p.A. Silos di Genova, 2 x certificates, both 1953, and Societa della Ferrovia Sicula Occidentale Palermo-Marsala-Trapani, unissued, Rome 1930, all VF. (5). 112 Russia, 10 railway bonds, Orel-Vitebsk 1894 Loan, bond for 125 roubles, Tambov Saratov 1882 Loan, bond for 125 roubles, Moscow Kazan 1909 Loan, bonds for 500 marks and 2,000 marks, 1911 Loan, bond for 500 marks, Moscow Windau Rybinsk 1898 Loan, bonds for 1,000 marks and 2,000 marks, and Podolische 1911 Loan, bond for 500 marks, 1,000 marks and 2,000 marks, all with coupons, mostly VF. (10). 113 Russia, 11 railway bonds, Kursk-Kiev 1887 Loan, bonds for 500 marks, 1,000 marks and 2,000 marks, Rybinsk 1895 Loan, bonds for 500 marks, 1,000 marks and 2,000 marks, South West 1885 Loan, bond for 125 roubles, Orel Graisi 1887 Loan, bond for 600 marks, Moscow-Riasan 1885 Loan, bond for 2,000 marks, Kursk Charkov Azov 1888 Loan, bond for 600 marks, and Wladicaucase 1885 Loan, bond for 125 roubles, all except Rybinsk Loan with coupons, mostly VF. (11). 119 Russia, 9 railway bonds, all 500 franc denomination, Nord Donetz, 1914, Atchinsk-Minoussinsk, 1914, Moscow-Lief-Voronege, 1914, Moscou-Kazan, 1914, Riazan-Ouralsk, 1914, Boukhara, 1914, Mer Noire, 1913, and 2 x L?Altai, 1912, all with coupons, all VF. (9). 121 Russia, Banque Fonciere du Gouvernment de Kherson, bond for 1,000 roubles, 1910, vignette of peasants in wheat field, red, also, City of Kharkov 1911 Loan, bond for 187.50 roubles, and Lombard de la Capitale Petrograd, certificate, 1917, all with coupons, F-VF. (3). 122 Russia, City of Nikolaef 1912 Loan, 2nd series, bond for £20, coat of arms at top, brown, with coupons, VF. (1). 123 Russia, Imperial Land Mortgage Bank for the Nobility, bonds for 100 roubles, 150 roubles and 1,000 roubles, all 1898, ornate border, various colours, with coupons, VF. (3). 125 Russia, Russia State Loan of 1905, bonds for 500 marks, 1,000 marks, 2,000 marks and 5,000 marks, ornate design, various colours, all with coupons, VF. (4). 129 Stock Exchange Official Intelligence 1927. Good second hand condition. 130 Stock Exchange Year Book 1900. Slight damage to spine otherwise good second hand condition. 131 Stock Exchange Year Book 1904. Damage to spine otherwise good second hand condition. 132 Stock Exchange Year Book 1910. Good second hand condition. 134 Stock Exchange Year Book 1928. Good second hand condition. 135 Stock Exchange Year Book 1933. Good second hand condition. 1062 Argentina, Campos Eliseos S.A., certificate No.216 for a 300 peso share, Buenos Aires 1889, very attractive large vignette of allegorical figure and pleasure park, brown, yellow & orange, VF. (1). 1063 Australia, Associated Financial Corporation Ltd., 10 x debentures for £100, all dated 1902, ornate border, black, UK revenue stamp, all VF. (10). 1064 Cameroon, Société Nationale du Cameroun, action privilégiée, Paris 1924, large panoramic vignette of busy river scene, black & mauve, with coupons, VF. (1). 1068 China, Bank of Canton Ltd., certificate No.2142 for one second preference share, 1937, ornate border with underprint of bank building, text in English and Chinese, orange with red seal, VF. (1). 1069 China, Bank of China Co. Ltd., certificate No.303 for one share, 1923, ornate design, text in Chinese, was formed in 1912 and is the oldest bank in China, today it is one of the worlds top ten banks by market capitalisation, reddish brown, AVF. (1). 1070 China, Central Bank of Manchukuo, certificate for 100 shares, 1932, ornate design incorporating dragons, underprint of building, text in Chinese, black, VF. (1). 1072 China, Chinese Government 1912 Gold Loan, 5 x bonds for £20, and 5 x bonds for £100, ornate design, black & blue and black & green respectively, all with coupons, mostly VF. (10).